Yo wazzup! 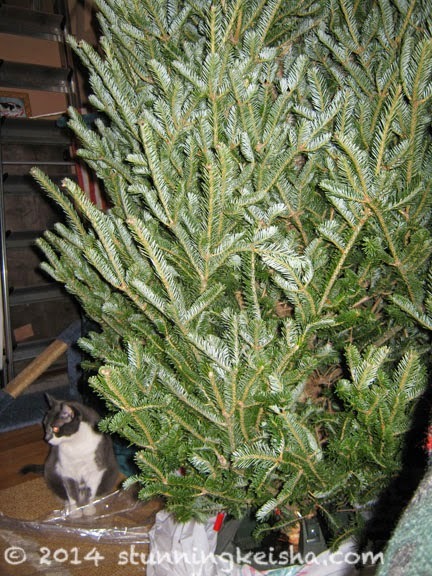 About now you’re axing yourself why I’m featuring an unflattering photo of myself with red eyes in front of a nekkid Christmas tree and it isn’t even Halloween! No, the peeps haven’t flipped and gotten their tree already. In fact, this is File Footage from 2011. You all remember Niles, don’t you? Well guess what? It’s back! My Fall Foto Frenzy is back! BWAHAHA! The foto above is number 2014, the same as our current year. Last year so many of you helped me out by picking a number and I thank you from the bottom of my flinty heart. This time you can pick numbers up to 4097. This is fun cos I promise that the fotos you pick will be uncensored and unPhotoShopped. It is what it is! You get to see the mess that TW usually crops or clones out of the foto. You get to see the fotos of me with laser eyes that she usually doesn’t publish. You get the see the blurry fotos that only get published as art work on Caturday in their blurry glory. You’ll even get to see me in not so flattering poses. In short, you get to see the foto fails and TW’s dirty laundry as a photographer. HAH! I can’t keep a straight face after using the words TW and photographer in the same sentence. Here’s number 3014. TW wouldn’t have used this foto without trying to brighten it up a little bit. 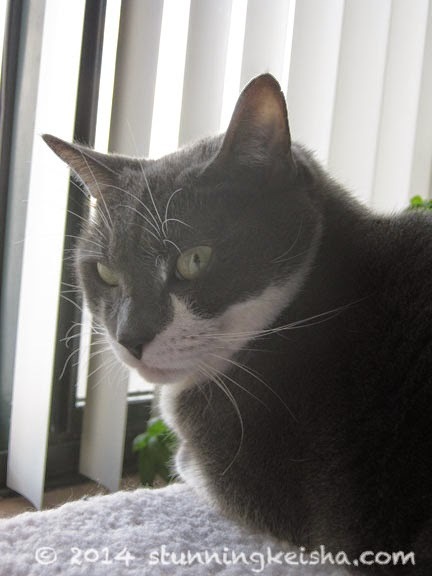 I’m sitting on my long gone (to A Call 4 Paws) Tree of Pain and Suffering—TW’s pain and suffering, not mine—and looking at some Bird-tv. I was minding my own beeswax before the flashy box came along. Beside shooting directly into the light, she wasn’t using flash so I’m all washed out but not down. I’ll bet she was planning on cropping in close to my face and using it as a stunning closeup. Heh! In addition, I’ll tell you the story behind the foto which was no doubt taken to be used in a long-lost blog post idea that never made it. It’ll be fun—and a bit embarrassing for TW. All you have to do is leave a comment with a number between one and 4097. Be original please. 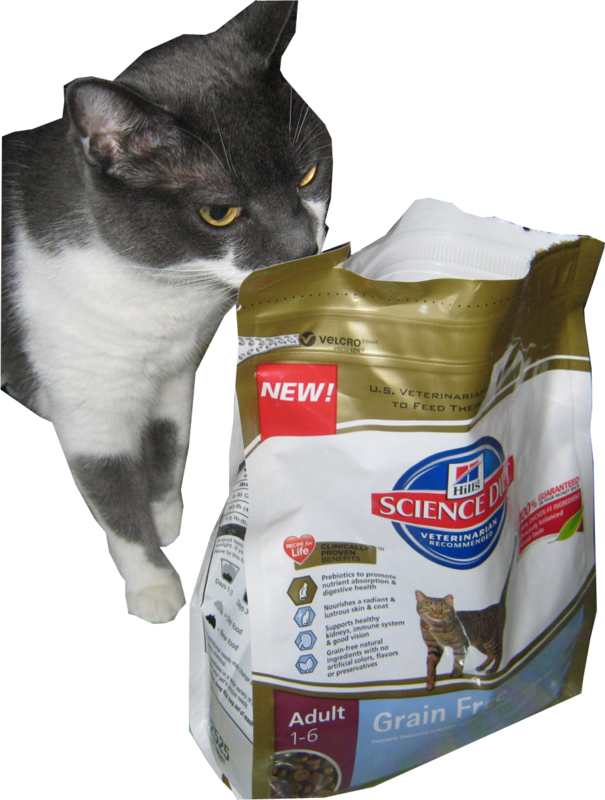 The Hill’s® Science Diet® Healthier Pets, Happier Lives giveaway ends September 30. I’m giving away two bundles. You can choose between a dog or cat bundle. The dog bundle includes a stainless steel dog bowl, a bag of Hill’s Science Diet Dental Chews, a bag of Hill’s Science Diet dog treats and a Healthier Pets, Happier Lives tote bag. The little extras bundle for cats includes a laser pointer toy, a stainless steel cat bowl, eight micro cans of Hill’s Science Diet Grain Free entrees, and a Healthier Pets, Happier Lives tote bag. Thanks to Hill’s for hosting this giveaway. You can enter here. Good luck! What a fun idea! Trust me CK, we all take our share of craptastic pictures. I'm always trying to edit out junk in the background and try to find a hint of natural light. Wow that's a lot of photos... this should be interesting. How about number.... 1301. Me not suwe zackly what be goin' on CK but weez choose 555. Can yous tell weez like da nummew 5? MOL Hope yous hav a pawsum day. I love this idea! I pick 319, which is the month and day of my birthday! Great idea CK and we want number 55. Have a fabulous Friday. I think I go for 616 is my age plus my sis's age ! NIles is looking pretty good for an old tree. ; ) heh, heh. That is fun CK! I pick number 1202 please! What a fun! I'd be scared to do this myself as there are too many photo fails. How about 409. I pick 804 which is my birthday the UK way. I am hoping it will be a close up of your beautiful face. CK, we can't tell you how many crappy photos the mom has of all of us. Funny thing...she'll still use them and try to pass them off as being "okay." Sheesh. what a great idea CK! this is a fun one! we pick #794!